I just got this book, and I couldn't recommend it more. It is a coffee-table style book full of full page gorgeous photos of horses with the most unusual colors and patterns. There are brindles, blue eyes, pintaloosas, badger-faced Gypsy horses, dun paints, wild Curly horses...all photographed in fabulous action shots and artistic poses. A super book for those who love unusual horse colors! More Horse Colors Than You Can Handle! This spectacular book, by Ursula Schmidt-Basler, is unfortunately available only in German (but available through the US Amazon site, just click above!) Still, it is a must-have for anyone who loves unusual horse colors. It is the most comprehensive study of horse color I have ever seen, with a unique world-wide focus. Nearly every page features photos of interesting breeds and markings, which makes it a great read even if you only know a little bit of German. -Pinto and Leopard markings among the horses of Asia and the former Soviet Republics, including Mongolian, Altai, Lokai, and Tibetan horses. And that's just the first part of the book. The second part is devoted to details of color genetics, and an discussion of unusual markings like Bird Catcher Spots and Ink Spots and Brindle. At the breed show in Palermo/Argentina in 1949, a colorful pure Arab mare won the grand prize. Trabag (Tartar x Adua) went back through the chestnut stallion "Ajman" twice, to Mesaoud. Trabag was "white with brown." At first look it is difficult to tell, whether she is leopard (Appaloosa) marked or Overo marked. The Rabdeh mare owned by Abba Pascha Sherif was said to be similarly marked. In sum, a wonderful book, and even if you only have a little German under your belt, if you are obsessed with unusual horse colors I would highly recommend it! Unusual horse colors are a popular topic among visitors to this blog. Here is a short video of a dun Morgan horse that shows the characteristic markings and describes the bloodlines that carry this color, which is quite rare in Morgan horses. The mare, Amberfields Lonesome Dove, is a shade of dun also known as grulla. She is from Amberfields Morgans; their website has more colorful Morgans and useful information. Thanks, Judy, for showing off your mare for the video! Edited to add: Reader Nancy Castle posted a comment reminding me of a great resource for dun Morgan information: Dun Central Station It's a site I've visited in the past, but it had slipped my mind. Thanks for the tip, Nancy! This wildly colored, blue-eyed Criollo horse is further adorned with elaborate silver parade gear. The quotation below on the flickr page is from an old book, describing the fashion for silver parade tack in Argentina, and the great weight, quality and expense of the best-made adornments. Photo: Eduardo Amorim on flickr. This horse sports a shocking blue eye - unusual in a dark-faced horse. More commonly blue eyes are surrounded by pink skin and white hair - such as might be found in a horse with large white markings on its face. The unusual marking known as "splash," however, sometimes causes one or both eyes to be blue even when not surrounded by white. 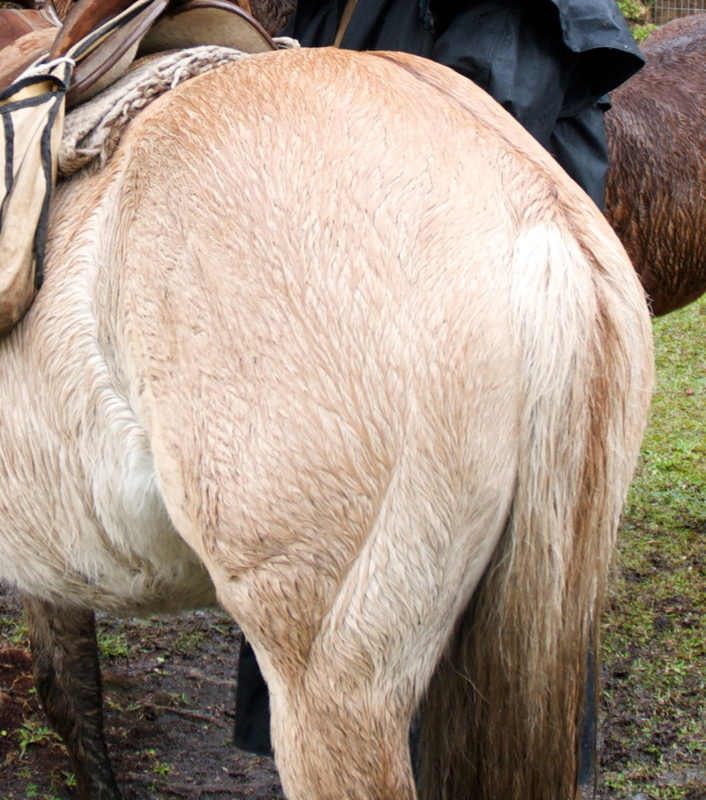 I saw several Crioulo horses in Brazil with an interesting color combination of pangare on a palomino dun coat. The palomino dun looks a bit like plain palomino at first glance, but the brown dorsal stripe is visible on the back and tail, and there are some leg stripes. The pangare marking gives the horse a bit of white around the muzzle, armpits, belly and flanks. These horses are in winter coats. The roached mane is typical of the gaucho region of southern Brazil. On the bay horse in the first picture you can see more clearly that a "handle" is always left long at the withers, to aid the rider in mounting. The horse in the background is the color called grulla. 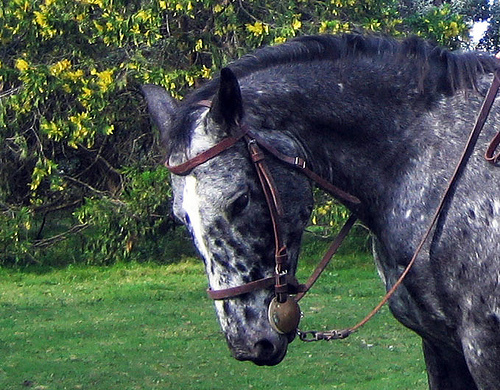 Spotted coloration occurs in the Argentine Criollo horse. Andrea sf on flickr has some nice photos, such as the one at left. The horses in her photos are from a ranch, Las Divisas, which specializes in leopard-pattern horses (flash-heavy site with music, but click "Fotos" to see dozens of snapshots of their horses). 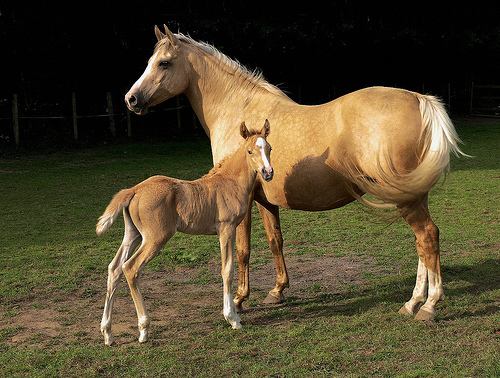 Palomino is a color based on chestnut, with a dilution gene causing the body color to become a gold or dark cream color, and the mane and tail to be white. It does not breed true, and is most often bred by crossing a chestnut horse with a cremello horse. For details of the genetics, read this page. Similar colors in appearance, but not to be confused with palomino, are flaxen chestnut, in which the body is a reddish brown and the mane and tail are blond; and the dilutions called cream or cremello, perlino and champagne, in which the entire body, mane and tail are an even white, beige, cream or gold color. 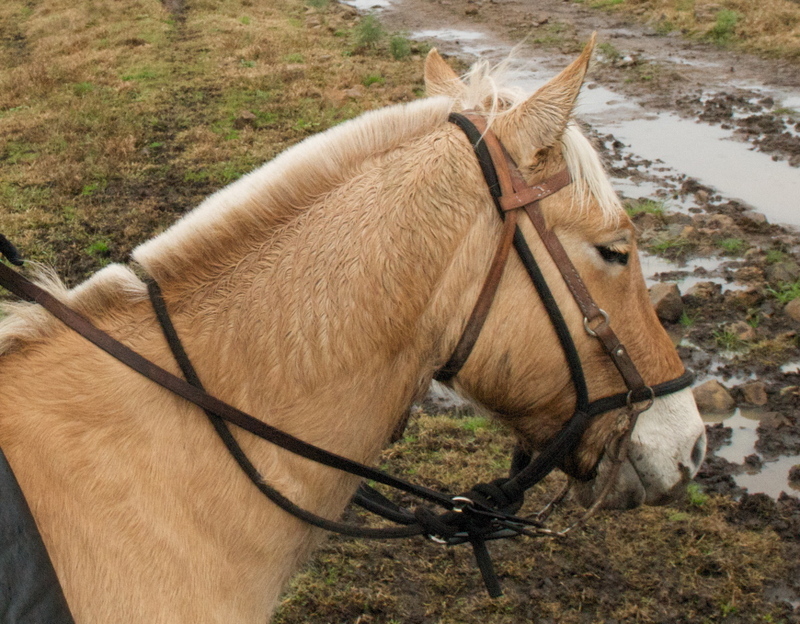 The Haflinger and Belgian Draft are two breeds that often appear to be palomino, but are actually flaxen chestnut. Similar appearance, different genetics. 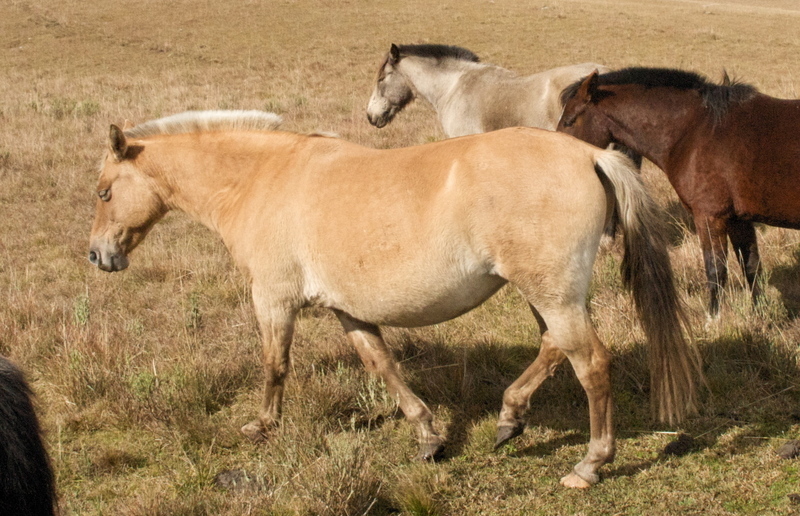 In cold climates the winter coat of the palomino may appear white or cream colored, darkening to gold again in summer. Arabian horses don't come in palomino, as the dilution gene doesn't exist in Arabians. Horses that appear to be palomino Arabians are (as far as I've ever seen) part Arab (even 15/16ths Arab) and the dilution was introduced by another breed. It has been thought that Thoroughbreds don't carry dilution either, as it is very rare, but this page shows a cremello and some palominos.